To fulfill the requirement of our valuable clients we are engaged in providing Element Holding Bricks. We take enormous pleasure to present ourselves as the noticeable manufacturer, exporter and supplier of Elements Holding Bricks in Ludhiana, Punjab, India. 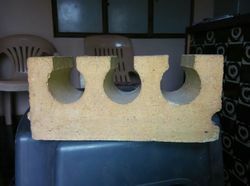 Our provided bricks are manufactured by using. We are one of the most distinguished manufacturers, suppliers and exporters of Heating Element Bricks for Electric Furnaces. These are manufactured with the superior quality material with advanced technology and machines. The range is subjected to special firing treatment to maintain the quality. We are majorly looking query from Jharkhand, Bihar, Orissa, Assam, Meghalaya, Uttar Pradesh, Madhya Pradesh, Andhra Pradesh and Chhattisgarh. So as to uphold the standing we have built up, we are engrossed in presenting a broad compilation of Element Holding Bricks. With sincerity and hard work of our professionals, we have carved a niche for ourselves in this domain by offering premium quality gamut of Heating Elements Bricks.